Things looked up in 1850. Eight stories up, to be precise. The future seemed bright for Dr. David Jayne, his new building and booming business on Chestnut Street. Jayne’s patent medicines in handy little bottles had been flying off the shelves ever since he figured out how to make people feel good spending money on tonics and pills. If Jayne’s vermifuge (for intestinal worms) or his sanative pills (for overall health) or his alteratives (to restore normal health) wouldn’t do the trick, there were always his expectorants and ague mixture. And even if you felt just fine, you probably could look a little better. For that, Jayne offered an array of oleaginous hair tonics and dyes. How did he manage such a level of success? 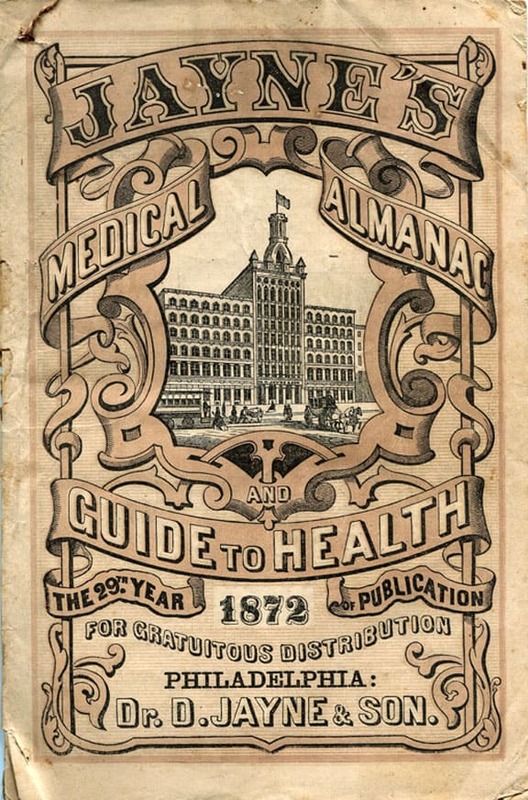 Since 1843, physician and master marketer Jayne had published and distributed free almanacs providing health advice to millions of loyal readers across the United States and around the world. Over time, more than half a billion copies of Jayne’s Medical Almanac and Guide to Health were printed and distributed. And beginning in 1851, nearly every one featured the image of his building on its cover. The Jayne Building was no ordinary edifice. Only at street level did it seem like others along the lower blocks of Chestnut. But the higher it rose—and it soared to more than 133 feet with its two-story, tin-covered, Gothic tower—the Jayne Building stood taller than any other place of business in the city. Squinting away its Gothic motif, it even looked like a skyscraper. Since Louis Sullivan, who later designed the real thing in Chicago, briefly worked in the architectural offices of Frank Furness across street, there might even have been an influence. In 1950, on the building’s 100th birthday, Charles Peterson publicly made this claim. “In the annals of the American skyscraper there was, perhaps, nothing more daring as the design for this building…” Peterson proposed it be allowed to stand (without its tower, which had burned in a dramatic fire in 1872) as one of Chestnut Street’s monuments to American history. He had the Jayne Building documented by the Historic American Building Survey (Peterson had some pull there, having founded the program in the 1930s), and he talked about it and even distributed a two-page mimeographed handout to anyone who was game. Peterson bent Louis Mumford’s ear as he researched a series of articles about Philadelphia for The New Yorker in the Spring of 1956. That project, of course, was Independence National Historical Park, which favored 18th-century buildings über alles. And within months wrecking crews were busy taking Jayne down. For scars like that, and the regret that followed, there would be no tonics or ointments.